The coconut palm is a palm found worldwide in tropical climates. Its natural habitat is the coastline, often growing in the sand or on the edges of coastal forests. This is because the seeds (or coconut) fall off the tree into the sea and germinates wherever it’s been washed up on the beach. 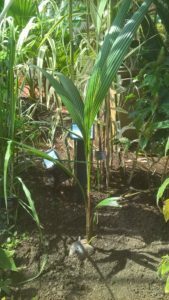 It is for this reason that no one really knows where the coconut palm first originated, although it is presumed to be somewhere in the west pacific. It is fast growing, reaching heights of 30 m – in comparison our newly planted specimen is only a baby! The hard-cased fruit, botanically speaking, is a drupe and not a nut. It has a white, nutty, edible flesh. Within this, there is a cavity partially filled with ‘coconut milk’ that can be drunk. In the tropics, the wood and leaves are used for building houses and fuel, while coir is made from the husk fibres of the fruits outer coating and is used for matting and compost. It needs a minimum winter temperature of 18 degrees and a moist, but well-drained soil that sits in full sun with high humidity to do well. This is why so many people struggle to keep them in their homes during the winter!